Jefferson "Freudian slip" in draft of Declaration of Independence? Today's AOL News includes a story by Lauren Frayer about a recent discovery concerning the Declaration of Independence, the 234th anniversary of the signing of which we celebrate tomorrow. The news is that chemical and photographic analyses of Thomas Jefferson's (image courtesy of NARA) first draft of the Declaration show that one of the words was changed after it had been written. This may not seem particularly significant; one would expect a first draft to be changed. What makes it interesting is what was deleted and what was substituted for it. 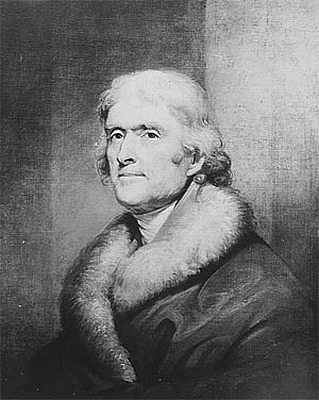 The word Jefferson wrote, then evidently rubbed out by hand while the ink was still wet, was "subjects", and the word substituted for it was "citizens". The difference between these words is, to put it mildly, a big deal. A "subject" is one who is subjected to monarchy. This was the status of British settlers in the American colonies and their descendants before the Revolution. "Citizen" is a word that, in English, dates from the fourteenth century; its first definition in Merriam-Webster is "an inhabitant of a city or town; especially: one entitled to the rights and privileges of a freeman". In medieval England, residents of cities or towns were not subject to feudal obligations, and therefore, although still "subject" to the monarch, otherwise free. By using the term "citizen" in the Declaration, Jefferson and the other signatories intended to signal the colonists' break from "subject" status. Scholars have speculated as to whether the smudge reveals a Freudian slip by Jefferson, who grew up as a subject of Britain's king, or whether his first draft adopted some of the language from a draft of Virginia's constitution, which uses the words "our fellow subjects." I doubt it was a Freudian slip, as that term is properly construed; that is, as an expression of a repressed or subconscious wish. I don't think Jefferson, at least by the time he was drafting the Declaration, had any lingering desire to remain a "subject". Applying Occam's Razor, I believe it was simply his repeating words from the draft of the Virginia constitution, of which Jefferson was also, along with James Madison and George Mason, an author. A happy Fourth to all!